(AP) BRANDON, Miss. - A prison guard was killed Sunday during a riot that also injured five other correctional officers and hurt three inmates at a privately run facility in Mississippi that holds illegal immigrants, authorities said. The riot began about 2:40 p.m. CDT and involved dozens of inmates before it was brought under control late Sunday night. Adams County Coroner James Lee confirmed that a guard died, but said he could not provide any other details until the correctional officer's family was notified. 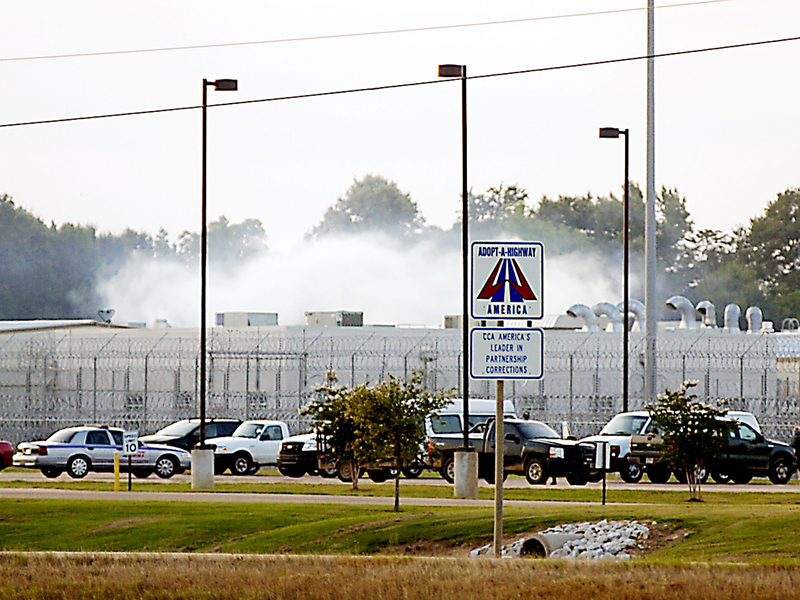 Emilee Beach, a spokeswoman at the Adams County Correctional Center in southwest Mississippi, said the uprising involved multiple inmates but she wasn't sure exactly how many because the investigation was still ongoing. She said that after the disturbance was brought under control Sunday night, inmates were being searched and sent back to their cells. The five injured guards were taken to a hospital and treated for injuries that weren't considered life-threatening. The 2,567-bed prison in Natchez houses adult male illegal immigrants for the Federal Bureau of Prisons. CCA spokesman Steve Owen confirmed in an email "there has been one employee death" but he said he could not provide more details immediately. He said in an email early Monday "it is my understanding that all staff are accounted for." He said the company was investigating what prompted the uprising. Adams County Sheriff's Department spokeswoman Emily Ham said no inmates had escaped the facility. After the uprising began, CCA's Special Response Team and the Mississippi Highway Patrol's SWAT team sought to quell activities within the prison while state and local law-enforcement officers secured the perimeter of the complex, Adams County Sheriff Chuck Mayfield said in a statement. Mayfield told the Natchez Democrat that 15 employees were freed at one time during the uprising by opening a fence and protecting the route with guns. The sheriff said in a statement early Monday that there were at least two dozen hostages being held at one time. Mayfield added that prison personnel had "gained total control" of the complex. "Right now, we have three inmate injuries that were probably sustained from other inmates  one being a stab wound, concussion and rib injuries," Mayfield added. "There were no escapes."